Welcome to the Third case in our Air Care and Mobile Care Flight Orientation Curriculum for 2016! Every few weeks throughout the spring and early summer, there will be a series of posts and cases published to help spur some thought and discussion on the management of the critically ill patients we take care of in the pre-hospital environment. These virtual flights will be used to highlight some key considerations in the management of blunt poly-trauma, severe TBI, penetrating trauma, STEMI, acute neurologic emergencies, and several other common disease processes seen on Air Care. It is late on a blustery grey and rainy day in November and you are the dedicated flight doc on Air Care One (the “UH”) nearing the end of your shift. Your pilot has had to turn down two flights already due to high winds and reduced visibility as bands of storms moved through the area. Against your better judgment, you are standing in the sushi line in the hospital cafeteria to grab dinner when you hear “Air Care One Pilot, weather check for a patient coming back to the U” squawk out over your portable radio. Your excitement rises as “we can do that” echoes over the radio and you hear the tones drop for your flight. You grab the blood cooler and meet your crew for takeoff on the roof. As you cruise south over the black rolling hills into northern Kentucky, you cannot help but note the inky darkness and complete lack of shadows due to the thick layer of clouds sitting two thousand feet above you. The visibility has cleared towards the horizon, but it is still quite the bumpy ride as you scan for other aircraft. Your pager alarms, informing you that you are responding to a small community hospital for a “seizure patient”. You land at the stand-alone emergency department, unload the stretcher and equipment with your flight nurse, and walk inside. You are directed towards room 1 and find an anxious appearing physician who informs you that the patient presented actively seizing for an unknown amount of time. He notes that he administered 5 mg of IM midazolam, 10 mg of IV lorazepam, and one gram of IV levetiracitam before the “grand mal” seizure stopped. He states that the patient, a 54-year-old man, has a long history of alcoholism and a vague “epilepsy” history. He is “notoriously non-compliant with his medications”. He was brought in by EMS after being found down in the driveway by his wife just prior to arrival. Last seen normal 1 hour prior. The OSH nursing staff has begun two peripheral IVs and just hung a 1 L bag of LR. A non-contrasted head CT was reportedly normal. They have arranged for a transport to the emergency department at the University of Cincinnati for evaluation by neurocritical care and ask if you have any further questions. Neurologic: Fixed rightward gaze deviation as above. No spontaneous movements, to voice, or to painful stimuli. Right upper extremity seems slightly rigid and extended compared with the left. No vocalizations can be elicited. What are your initial thoughts at the beginning of this patient encounter? What is your differential? What are your first actions at the bedside of this patient? Are you going to need any medications? If so, what? What are you going to do in flight for this patient? 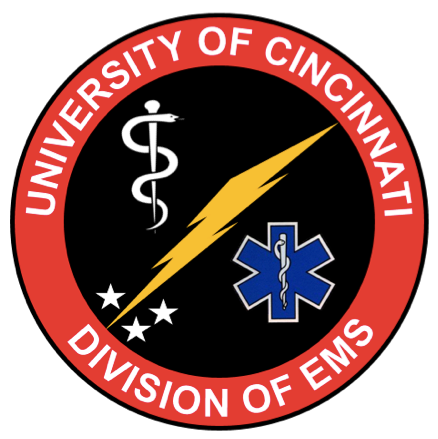 What are you going to say in your radio report to the ED attending at UC? Does your differential change if the gaze is fixed downward? Now, consider a similar patient, but instead of a rightward gaze preference, the patient’s right pupil is 5 mm and the left is 3mm. The non-contrasted head CT demonstrates a large intra-cerebral hemorrhage in the right basal ganglia with 6mm of R->L midline shift. The patient is also therapeutic on Coumadin for chronic A-fib. Does your initial bedside assessment and management change? What management strategies would you employ during transport? Are there any specific medications that we want to ensure that we utilize? Now, instead of a seizure patient, this patient presents to the OSH with an exam consistent with a R MCA syndrome. The non-contrasted head CT demonstrates a R MCA sign. The OSH physician has administered a tPA bolus, which is about to finish. What changes in regards to your management of this patient? How is the rest of the tPA administered and what peculiarities do you need to know about the differences of administration of tPA in flight versus in the ED? What do you need to make sure that you document?